I’ve seen a few videos ands hundreds of images featuring the idea of an amazing Goku Vs Superman fight. Personally I can’t see why they would fight but if they had a reason it would be a real clash of the titans. 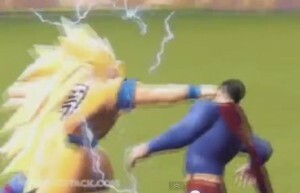 This is one of the best videos of a Goku Vs Superman right. It looks like it must have taken weeks to make and looks to use a Goku model from one of the games. In the video we get to see Goku go from normal to Super Saiyan 4 which makes it well worth a watch.